Rust-resistant galvanized steel wall mount mailbox features a durable black powdered coat finish with an easy lift tab style lid. Includes a stylish embossed lettering feature on the front panel. Fully assembled. Mounting hardware sold separately. Size: 6.1"H x 15.2"W x 3.9"D. Locking galvanized steel wall mount mailbox with a durable, rust-resistant powder coat finish. This wall mount has a new contemporary designed lid that features a concealed cam lock with two keys to secure your incoming mail. Size: 10.1" H x 8.6" W x 4.1" D. Wall mount mailbox is constructed of a durable polypropylene. Weather and rust resistant. Front panel has a classic decorative engraved design. Comes fully assembled. Size: 7.9"H x 15.5"W x 4.7"D.
Wall mount mailbox is constructed of a durable polypropylene. Weather and rust resistant. Front panel has a classic decorative engraved design. Comes fully assembled. Size: 7.9"H x 15.5"W x 4.7"D. Round post with decorative scrolls. Made from steel with a rust-resistant powder coated finish. Designed for in-ground installation with concrete. Recommended with standard size mailboxes. Size: 52.1"H x 6"W x 10.7"D. Smooth rust resistant galvanized steel mailbox comes fully assembled with steel latch and aluminum flag. Medium capacity is standard in most households and can hold letters, magazines, padded mailers and small boxes. Size: 8.9"H x 6.9"W 20.1"D.
Rustproof polypropylene plastic resists impacts and all types of weather while providing outstanding service. The mailbox body incorporates a ribbed design on top and textured side panels. Medium size holds magazines, padded mailers and small boxes. Comes fully assembled. Size: 9.8" H x 7.9" W x 20.4" D. Classic large, rural mailbox comes fully assembled with steel latch and aluminum flag. Large capacity can hold several pieces of mail and small parcel. Smooth rust resistant powder coat finish. Size: 10.9"H x 8.7"W x 22.6"D. Classic large, rural mailbox comes fully assembled with steel latch and aluminum flag. Large capacity can hold several pieces of mail and small parcel. Smooth rust resistant powder coat finish. Size: 10.9"H x 8.7"W x 22.6"D.
Classic large, rural mailbox comes fully assembled with steel latch and aluminum flag. Large capacity can hold several pieces of mail and small parcel. Smooth rust resistant powder coat finish. Size: 10.9"H x 8.7"W x 22.6"D. Rustproof polypropylene plastic construction provides durability while the ribbed body adds strength. Incoming mail flag notifies homeowners of deliveries. Wide, large opening easily holds small packages along with daily mail. Size: 9.5"H x 12.4"W x 21.3"D. Flap and back plate included. Size: 10"W.
Flap and hood plate.13"W x 3"H. Lockable wall mount mailbox constructed from rust-resistant galvanized steel and has a durable powder coat finish. For security this mailbox has a concealed cam lock and comes with two keys. Its medium capacity can hold magazines and large envelopes. Optional decorative emblem included. Size: 12.6" H x 9.7" W x 4.4" D. Mounting hardware sold separately. Lockable wall mount mailbox constructed from rust-resistant galvanized steel and has a durable powder coat finish. For security this mailbox has a concealed cam lock and comes with two keys. Its medium capacity can hold magazines and large envelopes. Optional decorative emblem included. Size: 12.6" H x 9.7" W x 4.4" D. Mounting hardware sold separately. Lockable wall mount mailbox constructed from rust-resistant galvanized steel and has a durable powder coat finish. For security this mailbox has a concealed cam lock and comes with two keys. Its medium capacity can hold magazines and large envelopes. Optional decorative emblem included. Size: 12.6" H x 9.7" W x 4.4" D. Mounting hardware sold separately. 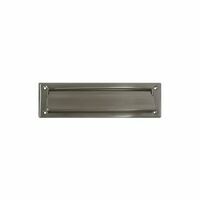 Medium wall mount mailbox is constructed of heavy-duty galvanized steel with a textured finish. Fully assembled. Mounting hardware sold separately. Size: 9.8" H x 16.6" W x 4.5" D. Standard post. Grade #1 Southern Yellow Pine. Prowood Micro CA mold inhibitor. Pre-assembled for easy set-up. 4" x 4" wood construction. Size: 72"H x 4"W x 4"D.
Spring loaded front plate, standard back plate. Opening: 11"W x 2"H. Weather-Tite construction featuring interlocking flap and frame. Spring loaded front plate, insures tightly closed position. 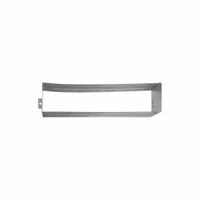 Overall size: 13" W x 3-9/16"H. Spring loaded front plate, standard back plate. Opening: 11"W x 2"H. Weather-Tite construction featuring interlocking flap and frame. Spring loaded front plate, insures tightly closed position. Overall size: 13" W x 3-9/16"H. Spring loaded front plate, standard back plate. Opening: 11"W x 2"H. Weather-Tite construction featuring interlocking flap and frame. Spring loaded front plate, insures tightly closed position. 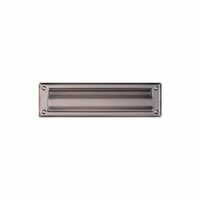 Overall size: 13" W x 3-9/16"H.
Medium wall mount mailbox is constructed of heavy-duty galvanized steel with a textured finish. Fully assembled. Mounting hardware sold separately. Size: 9.8" H x 16.6" W x 4.5" D. Made of a high quality galvanized steel mailbox and a dual reinforced steel post with a decorative scroll. Assembles in minutes, comes complete with a mailbox, post, and mounting hardware. Decorative embossed eagle on the door. USPS approved. Grade #1, southern yellow pine. Prowood Micro CA mold inhibitor. LifeGuard, water repellent pressure treatment. Size: 72"H x 4"W x 4"D.
Jumbo size mailbox is constructed from galvanized steel and has a durable ribbed body for extra strength. Extra-large capacity can hold mail for days as well as medium size parcels. Steel latch and aluminum flag. Rust resistant powder coat finish. Comes fully assembled. Size: 15?H x 11.7?W x 24.8?D. Jumbo size mailbox is constructed from galvanized steel and has a durable ribbed body for extra strength. Extra-large capacity can hold mail for days as well as medium size parcels. Steel latch and aluminum flag. Rust resistant powder coat finish. Comes fully assembled. Size: 15?H x 11.7?W x 24.8?D. Drive-in mailbox post does not require digging or concreting for installation. Constructed from rust-resistant galvanized steel with a black powdered paint finish. Features an adjustable mailbox support arm, which allows the mailbox to be adjusted to the proper height from the ground. Post accommodates standard and large size mailboxes. Kit includes all assembly and mailbox mounting hardware and instructions. Size: 59.9"H x 6"W x 20.8"D.
Deluxe decorative post with a durable multi-use mailbox mounting support which can hold either one or two mailboxes. Constructed from heavy-duty white plastic makes this a maintenance and rust-free post. It installs over a 4x4 wood post (sold separately) and accommodates standard or large size mailboxes. Kit includes a mounting bracket and hardware for easy installation. Size: 57?H x 6?W x 22.7?D. Constructed from durable non-rust polymer. No digging or concrete mixing required for installation. Ground mount and mailbox bracket included. Fits standard sized mailboxes. Size: 41.3"H x 6.3"W x 17"D. Locking feature help protect against identity and mail theft. Incoming slot is protected by a lift top lid and prevents rain or snow for getting in. Horizontal locking door allows for easy access to retrieve your mail and has a decorative embossed envelope design on the front panel door. Made of sturdy stainless steel construction for lasting beauty and will not rust. Size: 11.925 x 8.50 x 2.5. National Hardware Mail Slot, Series: V1911, Suitable For Use With: National NO 1911S Mail Slot on Hollow Doors, 2 X 11 in, Solid Brass, Antique Bronze, For Use On Exterior Entry Doors Heavy gauge steel body with aluminum trim, flag and bracket. Dual pin-hinged cast aluminum door assembly. Textured powder coat finish for rust resistance. Size: 9-1/2"W x 11"W x 23"D. Front and rear access to interior compartments. Spacious interior to hold letters, magazines and catalogs with room to spare. Molded-in newspaper compartment. Heavy duty poly construction. Mounts easily to 4"x"4 (10.2 x 10.2 cm) post. (Mailbox post sold separately). Note: With normal soil conditions and level ground, a standard 4?x4? post cut to 48 inch length is adequate for mounting your MailMaster mailbox with 24? in ground and 24? above ground. Includes: Address numbers, mounting hardware and rear post cover. DIMENSIONS: 51?H x 12-1/2?W x 23-1/4?D. Front and rear access to interior compartments. Spacious interior to hold letters, magazines and catalogs with room to spare. Molded-in newspaper compartment. Heavy duty poly construction. Mounts easily to 4"x"4 (10.2 x 10.2 cm) post. (Mailbox post sold separately). Note: With normal soil conditions and level ground, a standard 4?x4? post cut to 48 inch length is adequate for mounting your MailMaster mailbox with 24? in ground and 24? above ground. Includes: Address numbers, mounting hardware and rear post cover. DIMENSIONS: 51?H x 12-1/2?W x 23-1/4?D. Double-wall, rustproof plastic construction. Rear safety retrieval door keeps children and adults away from traffic. Medium capacity holds magazines, letters and small boxes. Ultraviolet paint inhibitor extends appearance. Size: 49.9"H x 10.2"W x 22.1"D. Front and rear access to interior compartments. Spacious interior to hold letters, magazines and catalogs with room to spare. Molded-in newspaper compartment. Heavy duty poly construction. Mounts easily to 4"x"4 (10.2 x 10.2 cm) post. (Mailbox post sold separately). Note: With normal soil conditions and level ground, a standard 4?x4? post cut to 48 inch length is adequate for mounting your MailMaster mailbox with 24? in ground and 24? above ground. Includes: Address numbers, mounting hardware and rear post cover. DIMENSIONS: 51?H x 12-1/2?W x 23-1/4?D. Steel constructed locking wall mount mailbox with an aged copper finish for a distinctive look. The wide incoming slot and locking mechanism is protected by a lift-tab door and includes an easy to follow template and instructions for the wall installation. Size: 12.5" x 6.75" x 16". Heavy gauge steel body with aluminum trim, flag and bracket. Dual pin-hinged cast aluminum door assembly. Textured powder coat finish for rust resistance. Size: 9-1/2"W x 11"W x 23"D. Double-wall, rustproof plastic construction. Rear safety retrieval door keeps children and adults away from traffic. Features a built-in compartment for newspapers or parcels. Large capacity holds magazines, letters and small boxes. Ultraviolet paint inhibitor extends appearance. Size: 49.6"H x 11.9"W x 22.4"D.
Double-wall, rustproof plastic construction. Rear safety retrieval door keeps children and adults away from traffic. Features a built-in compartment for newspapers or parcels. Large capacity holds magazines, letters and small boxes. Ultraviolet paint inhibitor extends appearance. Size: 49.6"H x 11.9"W x 22.4"D. Virtually indestructible & vandal resistant! Constructed of 20 lbs. of heavy gauge steel, its powder coat black finish ensures long life and durability. Stainless steel piano hinged door and heavy steel flag are secured with steel fasteners. Size: 9.6"H x 7.8"W x 20.3"D. Heavy-duty plastic and aluminum construction. Features heavy-duty cam lock with 2 keys. Internal mail tray holds outgoing mail. Rustproof. Deep, large capacity. Size: 13.3" H x 17.1" W x 8.4" D.
Heavy-duty plastic and aluminum construction. Features heavy-duty cam lock with 2 keys. Internal mail tray holds outgoing mail. Rustproof. Deep, large capacity. Size: 13.3" H x 17.1" W x 8.4" D. Constructed from heavy duty cast aluminum, weather-durable, powder coated finish will not rust. Serves as a full service locking mailbox and large capacity holds several days of mail. Assembly hardware is included for easy concreting. USPS approved. Dimensions: 50-1/4"H x 18"W x 12-1/2"D.